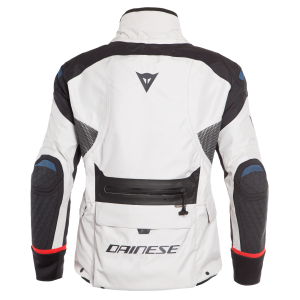 The new Explorer line from Dainese is now available in UK D-Stores, the perfect time to tackle winter adventures. Clothing in the Explorer range incorporates materials which are the perfect blend of technology, comfort, and safety. 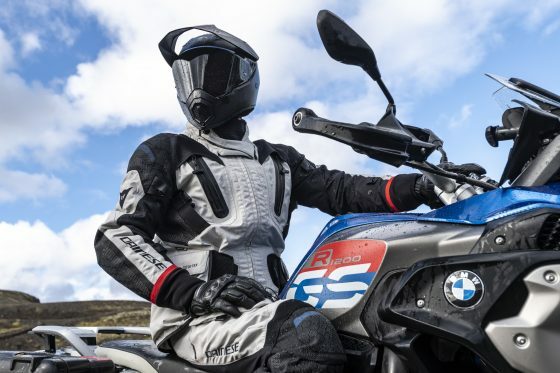 Whether it be the glacial cold of the Arctic Circle or the scorching heat of the desert, by way of mountain passes or long gravel roads, Explorer products are designed to protect riders and passengers in the most extreme weather conditions. Antartica sets a new standard for defying the effects of even the coldest climates. 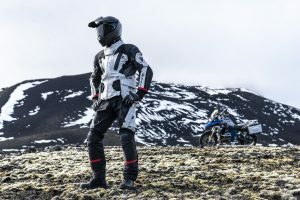 Consisting of the Antartica Gore-Tex jacket and pant, the two pieces provide the best solution for riders who enjoy the challenge of snow, ice and sub-zero temperatures. 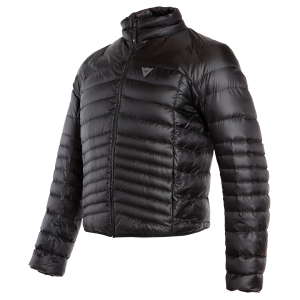 Antartica Gore-Tex features a removable inner goose down that serves as the first layer of insulation. 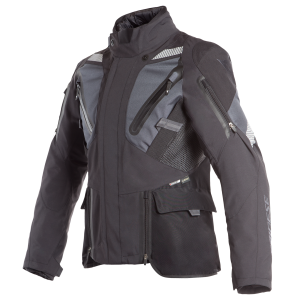 An inner jacket instills confidence in even the coldest weather and can also be worn separately, meaning warmth need not be sacrificed when off the bike. 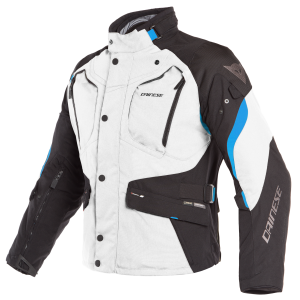 Both jacket and pant utilise a laminated Gore-Tex 45mm outer shell that provides unequalled protection against the elements. For situations where warmer weather emerges, direct-to-the-body vent zips at the chest and legs allow ventilation to maintain the ideal body temperature. 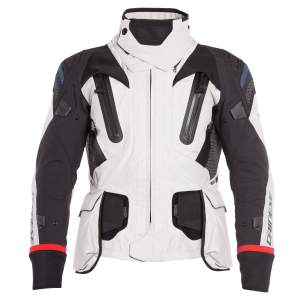 An inner adjustable lumbar belt on the jacket achieves a close but comfortable fit with all riders. 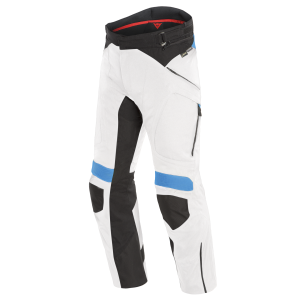 Outer pockets are designed for ease of use when in the riding position and moved to the hips so as not to compromise fit. Unique G.O.Pocket compartments allow rapid storage of gloves and items during a stopover – a feature an explorer cannot do without. 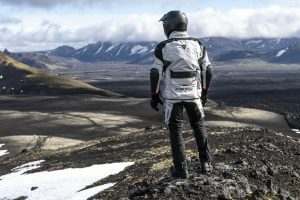 Antartica Gore-Tex uses a pro-armor Level 2 back protector, as well as Level 2 elbow and shoulder protectors to guarantee the highest safety standards. A pocket for a Double Chest protector is included if additional armour is desired. 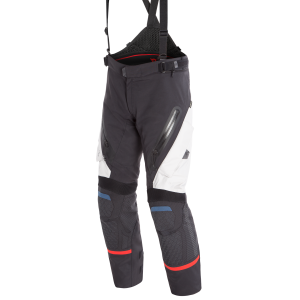 With certified hip protectors and Level 2 composite knee protectors, riders can be assured of premium protection. The Antartica Gore-Tex Jacket is available in sizes 34-52, in colours light grey/black and black/ebony, with an RRP of £1,299.95. 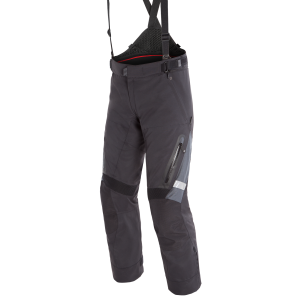 The Antartica Gore-Tex Pant, also available in light grey/black and black/ebony, in sizes 28”-46” comes with an RRP of £749.95. The Gran Turismo jacket and pant are constructed to be the finest solution when it comes to road touring wear. 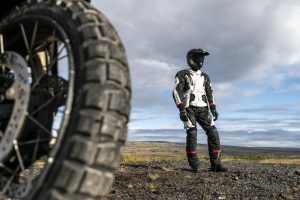 The two pieces encourage riders to go further and explore the open road with premium safety features and Gore-Tex durability. 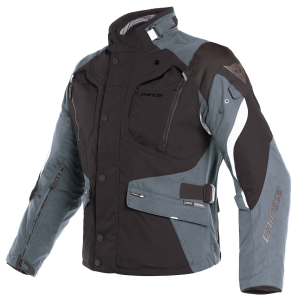 Both jacket and pant use a Gore-Tex 45mm laminated outer shell to provide superior protection against the elements. 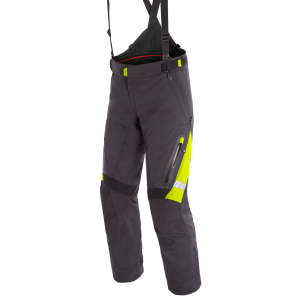 When conditions are more favourable, direct-to-the-body vent zips on the chest and legs allow the body to cool. 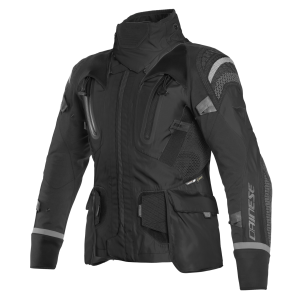 A removable thermal fleece acts as an insulating layer, trapping warm air, and can be used when not riding for a more casual look. 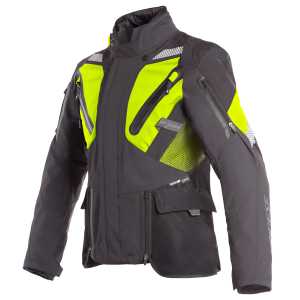 For the jacket, Nylon 6.6 abrasion resistance fabric with Armacor and Kevlar inserts are joined by a Level 2 pro-armor back protector and removable composite protectors at the elbows and shoulders. For the pant, identical fabric technology is partnered with removable Level 2 knee protectors and pro-armor hip protectors for the best in protection, anywhere, anytime. Gran Turismo is designed with convenience in mind, with an adjustable lumbar belt for a tailored fit and pockets designed to be easily accessed both on and off the bike. New G.O.Pockets provide compartments to rapidly store valuables and property, meaning the journey doesn’t have to stop for long. The Gran Turismo Gore-Tex jacket is available in sizes 34-52 in three colour options – black/ebony, black/fluo-yellow and black/orange/ebony – with an RRP of £949.95. The Gran Turismo Gore-Tex pant is available in black/fluo-yellow and black/ebony, in sizes 28”-46” with an RRP of £549.95. For the rider that doesn’t let the seasons stand in the way of their touring adventure, the Dolomiti line is the ideal choice. With year-round capabilities thanks to a modifiable design, the Dolomiti Gore-Tex jacket and pant take every season in their stride, keeping riders warm and dry at all times. The unique three layer construction of the Dolomiti Gore-Tex jacket allows for four different configurations to suit every condition: full summer, rain, cold and winter. 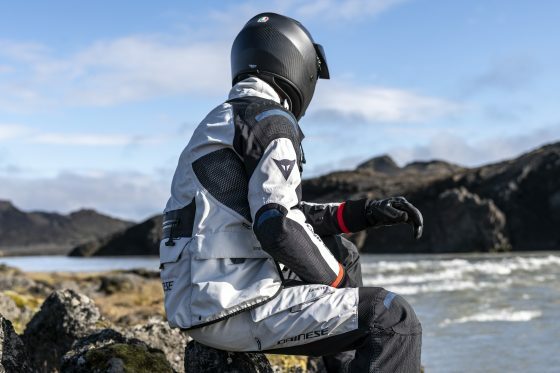 Warmer weather is tackled with front and rear vented panels, whilst a Gore-Tex inner membrane provides the best in waterproofing on rainy days. 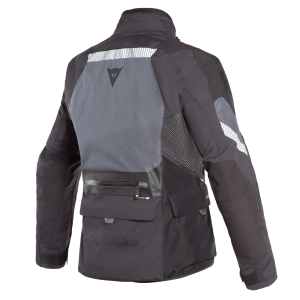 Inside, a removable thermal fleece insulates a riders body heat to keep them warm in cold conditions and can also be worn off the bike as a lighter individual layer. The Dolomiti Gore-Tex pant takes charge of every condition with direct-to-the-body vents located on the legs providing cooling on warmer days, paired with the same Gore-Tex membrane featured in the jacket to resist the worst of wet weather. Both jacket and pant use Duratex Main Fabric and D-Stone to create a tough but supple exterior. 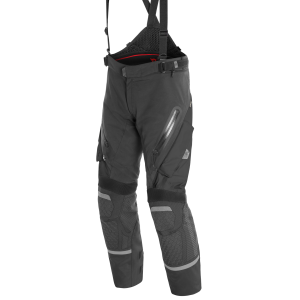 Removable composite protectors are featured at the shoulder and elbow of the jacket, and also at the knee of the pant with pro-armor at the hips. Pockets for chest and back armor allow for additional protection if required. 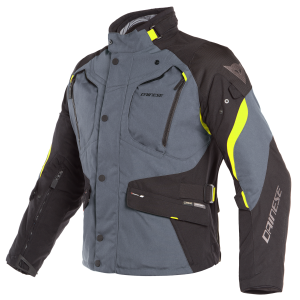 The Dolomiti Gore-Tex Jacket is available in four colour options – light grey/black/electron blue, ebony/black/fluo-yellow, black/ebony/light-grey and grape-leaf/black/red – in sizes 34-52 with an RRP of £549.95. 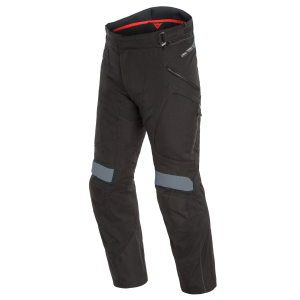 Available in sizes 28”-46”, the Dolomiti Gore-Tex Pant comes in three colour options – light grey/black/electron blue, black/fluo-yellow and black/ebony – with an RRP of £359.95. Made to be comfortable and provide all year round protection from the elements, the X-Tourer D-Dry gloves compliment any outfit in the Explorer range. 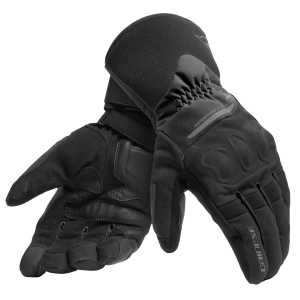 Ergo-Techno knuckles and PU leather palm reinforcements provide premium protection without sacrificing comfort. D-Dry fabric is breathable to suit warmer climates whilst providing a waterproof barrier to moisture when conditions are not so favourable. A visor wiper on the left thumb allows easy and safe removal of dirt and debris from visors and goggles whilst on the move. Touchscreen compatible fingertips add another level of usability when off the bike. 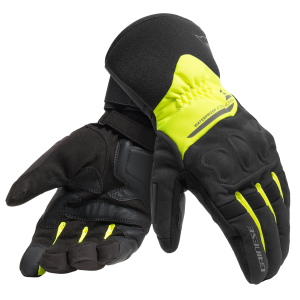 Available in black and black/fluo-yellow in sizes XS-XXXL, the X-Tourer D-Dry Gloves come with an RRP of £109.95. The X-Tourer D-WP boots effortlessly combine versatility, comfort and all-weather protection for the perfect match to any of the outfits in the Explorer range. Premium protection is catered for with rigid inserts around the malleolus and thermoformed reinforcement on the shin. A gear shifter guard provides a hard wearing surface for durability, with a differentiated rubber sole providing excellent grip in all weathers, both on and off the bike. 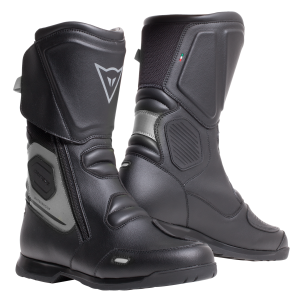 Reflective inserts around the boot increase a riders visibility in all conditions. Flexible joints allow the boot to pivot whilst walking, ensuring the X-Tourer D-WP is comfortable to wear at all times. A side closing zip and strap make them easy to put on and provide all riders with a snug, secure fit. The D-WP waterproof membrane provides a warm and dry shelter in wet weather, leaving a rider to enjoy the road rather than worry about the conditions. 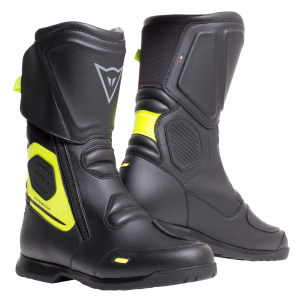 Coming in sizes 5-16, the X-Tourer D-WP is available in two colour options – black/anthracite and black/fluo-yellow – with an RRP of £169.95.